To evaluate the importance of recent contributions to our knowledge of genetic processes. To investigate genetic processes and analyze data to solve basic genetic problems involving monohybrid and dihybrid crosses. To demonstrate an understanding of concepts, processes, and technologies related to the transmission of hereditary characteristics. Describe recent contributions to genetic processes. 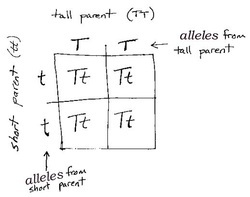 Diagram patterns of inheritance using punnett squares. List and describe the processes involved in the transmission of hereditary characteristics.